On September 3 we issued a news release detailing the deaths, in the Blackwater River (Isle of Lewis), of a substantial proportion of this Hebridean system’s wild adult salmon run. The corpses removed from the tidal Sea pool were likely just the tip of the iceberg with many more dying out in the sea loch. 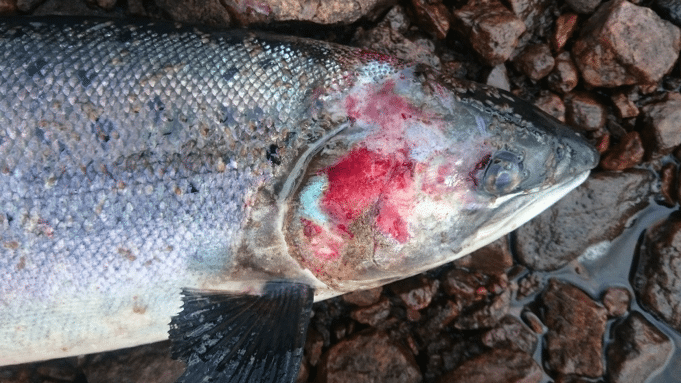 The underwater video of a moribund wild salmon, infested with and being eaten alive by many hundreds of sea lice and gasping for oxygen, made for disturbing viewing. A week later, on September 10, BBC TV One’s The One Show aired a short and graphic film linking the deaths in the Blackwater to very high numbers of lice and mortalities, again recorded on video, at the nearest salmon farm to the river in Loch Roag, the sea loch into which the river flows. The BBC programme and our earlier news release triggered widespread media attention – and rightly so, as this was undeniable evidence of catastrophic sea lice infestations of both farmed fish and wild fish. The only reasonable explanation for the wild fish deaths is that the sea lice, numbering up to 700 on each wild fish, had reached such high levels in the loch because the huge number of lice-infested host fish on the salmon farms had released an epidemic of sea lice larvae into the loch. The Fish Health Inspectorate, a Scottish Government agency, carried out tests on affected fish and concluded that no other factor was involved. There can be absolutely no doubt that the source of the infestations was local salmon farms. On the nearest farm, adult female lice numbers in August reached 13 times the industry’s Code of Good Practice. Incoming wild Blackwater salmon, held back by low water on the river, had been forced to wait in Loch Roag, close to the farms and exposed to sea lice larvae in numbers many orders of magnitude higher than any natural background. They never had a chance. Two weeks after we broke this story it is perhaps opportune to consider the reaction from the salmon farming industry to this evidence of the devastating impact on wild fish when on-farm lice numbers explode. One might imagine there would at least be a formal admission by the local farm’s operators (The Scottish Salmon Company, with its registered office in Jersey) that they were at fault, indeed something of a mea culpa. They and their industry’s spokespersons have shown not the slightest hint of contrition, rather they have fallen back on the usual response of denial and obfuscation. “Lice occur naturally in places like river mouths, where there is low water flow and a lot of returning wild fish”. In other words, the SSPO was trying to suggest that the wild fish deaths were simply a natural phenomenon and nothing to do with them! When the SSPO was formally challenged by a wild fish representative on Lewis for any evidence of similar sea lice infestations, past or present, on wild salmon in rivers, but outside the salmon farming areas, there was stony silence. On The One Show on September 10 the SSPO’s CEO maintained that only “one or two” fish on the Loch Roag farm were badly diseased and lice-infested. At this point the drone footage of the farm, playing behind her bland assurances, showed a multitude of fish in the cages with white heads, the classic sign of massive sea lice damage! “Weak judgment at several levels, which should necessitate appropriate consequences for the perpetrators”. It seems, however, that major parts of Scotland’s salmon farming industry still have fundamental issues with truth and integrity. Plus ca change.